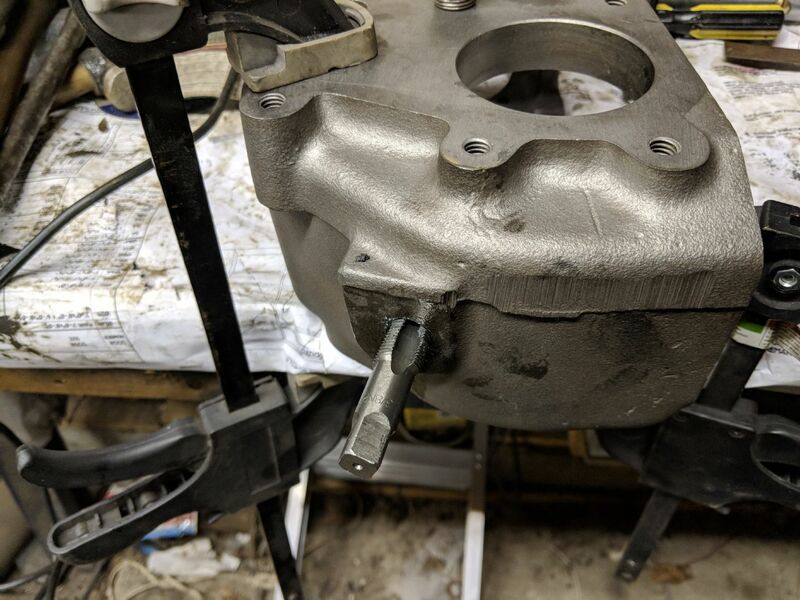 Started to put a D18 transfer case together to see if I can go slower. 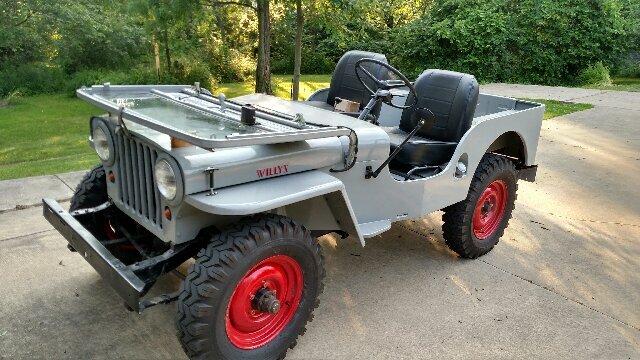 This all started last year when I took my '48 CJ2A 4-wheeling at the Spring Willys Reunion. A group of us had a blast slippin' and slidin' in the woods. I thought it would be great to have a little more control in a few spots, so started looking into lower gears. In an ironic twist, I had swapped lower gears in my '79 CJ7 several years ago. To do that, I took the gears out of a D18 and added them to that rare, unicorn of gears - a Bronco Dana 20 sliding gear. Thie changed my gear ratio from 2.03 to a 2.46. It made a HUGE difference crawling. I kept the Dana 18 donor case so I would have something to trip over in the corner of the shop. The ironic part is that I finally took that old case to the very same Willys Reunion and sold it for way dirt cheap. Here it turns out that the case, from a '71 V6 CJ5, was the rare case I needed to swap the TeraFlex low gears into! At least I also scored the unique Dana 44 flanged, offset rear axle. Well, I couldn't find a similar case, so I ended up getting a large hole donor case from a mid - 70s CJ5 Dana 20. And of course, I had to find a Dana 18 front and rear bearing retainer, shift forks etc, so I ended up buying another whole Dana 18 case. Thankfully, I will have something else to trip over in the corner of the garage again . 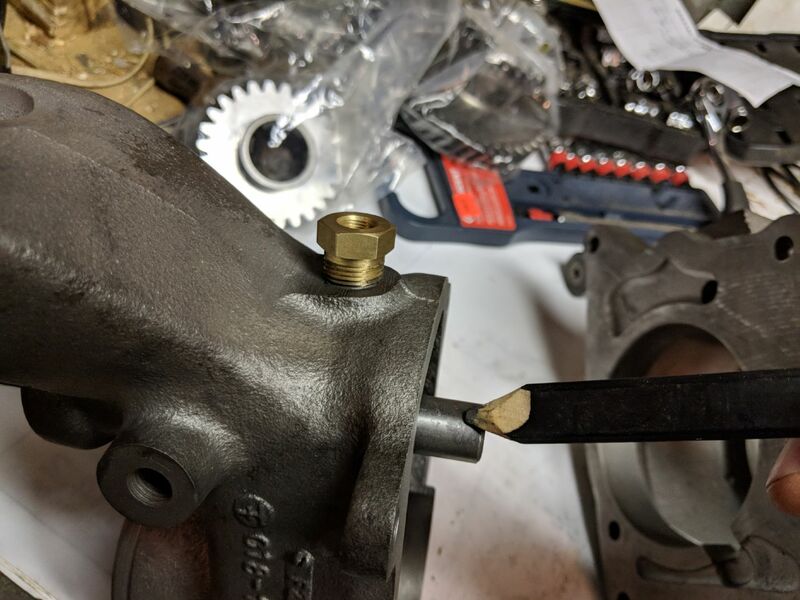 First problem with this case from a Dana 20 is the oil fill plug. The location interferes with rear bearing retainer/parking brake and you can't get to it to fill it! The solution is to tap a new fill hole and plug the old. The D20 fill pan had just the right low profile, recessed square hole 1/2" NPT plug. I ran the tap into the case a little further and ran the plug into the 1/2 NPT die a couple of times to get a deeper fit. Then we had to drill and tap a new fill hole. I couldn't bring myself to drill into the case with a nearly 3/4" drill bit, so I stepped the size down to a 3/8 NPT hole. I used the thick boss where my Spicer 18 case fills now. As Luck would have it, this case was already tapped for clutch pivot stud and a place-holder bolt was keeping the threads clean. 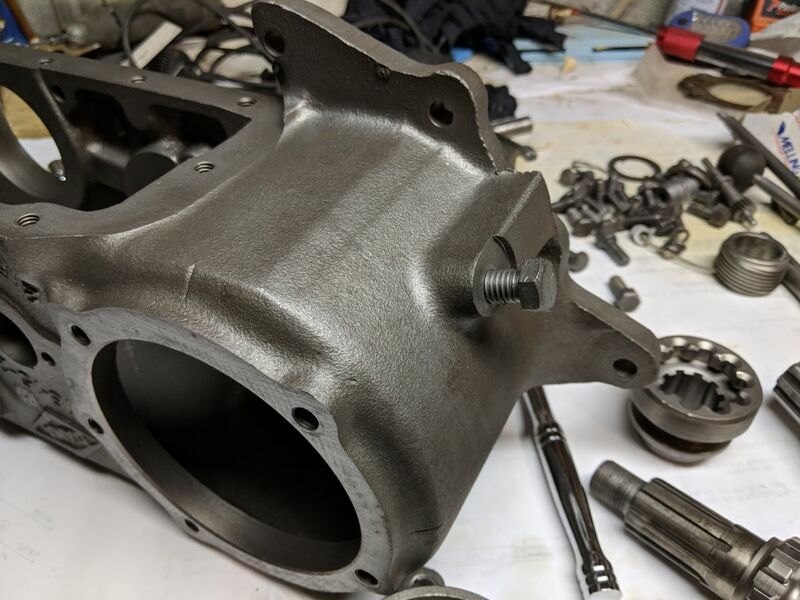 Next challenge occurred (if we don't count the hassle of removing and replacing the output shaft bushing) when reassembling the front bearing retainer. 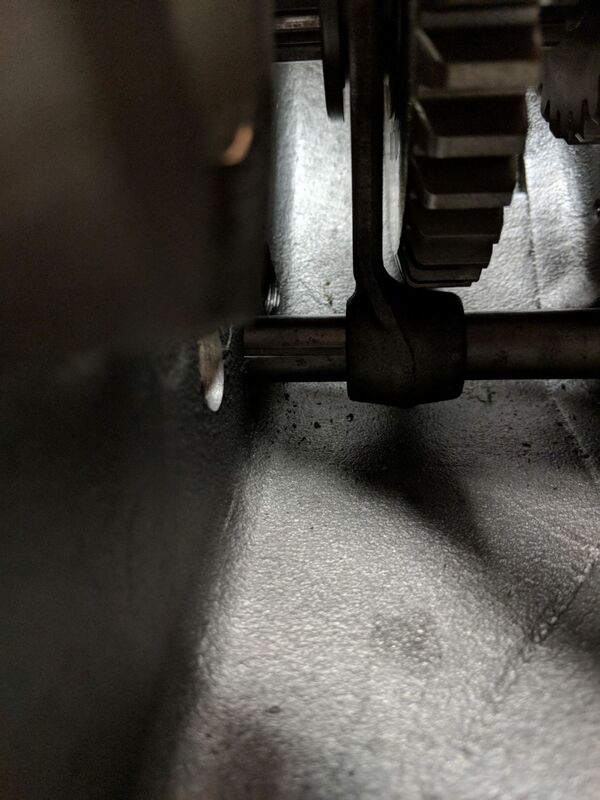 The TeraFlex instructions say to remove 1/2" of the shorter shift rail to avoid interference with the intermediate gear. Taking a whole 1/2" off seems like that when the shift rod is all the way forward, the rear part of the shift rod would pretty much come clear out of the main case. I guess we'll have to go real slow and keep trying it in and out. It will def. 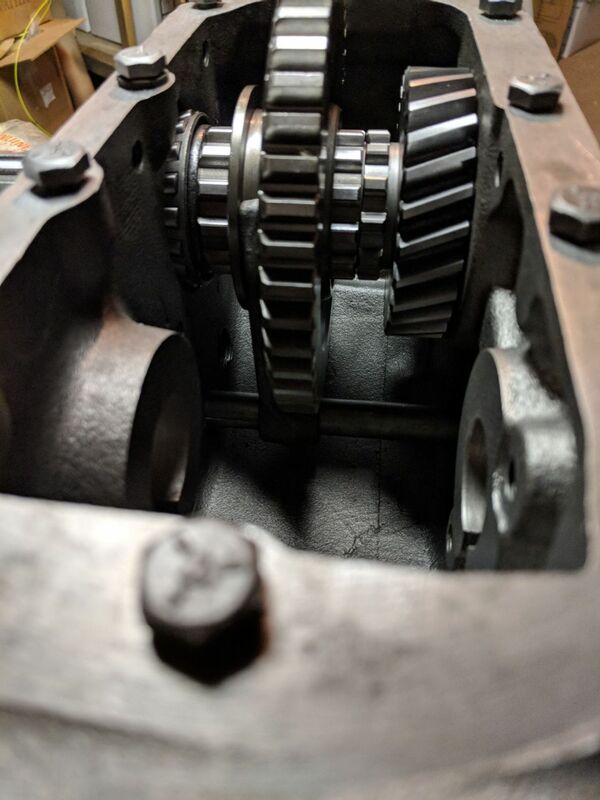 hit the intermediate gear now, and I guess I'm going to have load up all the needle bearings and actually place the intermediate gear for a final check. 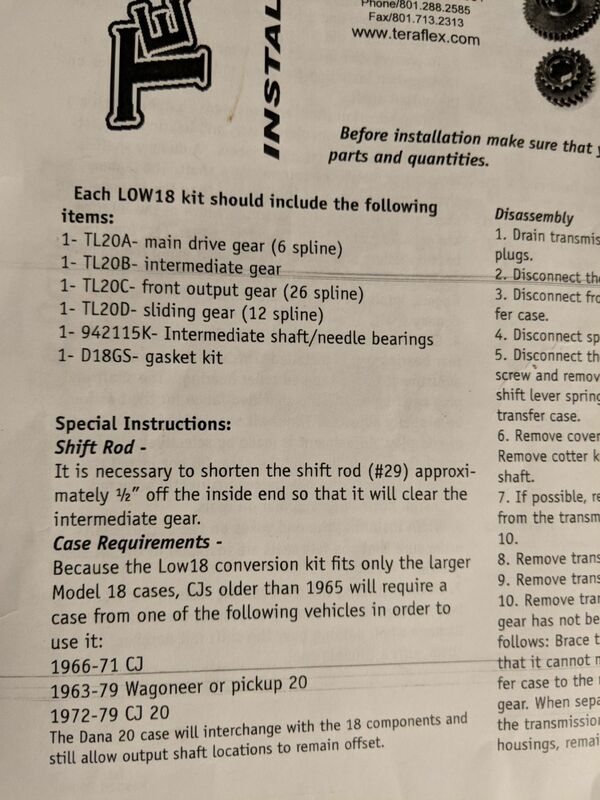 The instructions don't mention an interference with the underdrive shift fork (the bigger fork) and the output shaft sliding gear. Especially when I had mechanic's wire on the fork nut, the gear hits the collar of the shift fork. I have 2 different forks and both of them hit the gear. I'm going to clearance the collar of the shift fork, unless some one has a better idea. I think I will also use the later allen head set screw in the fork. Very impressive work. Cant wait to see this Jeep on the trail. Thanks for the post. I am planning on a Terralow upgrade this year on my Jeep. 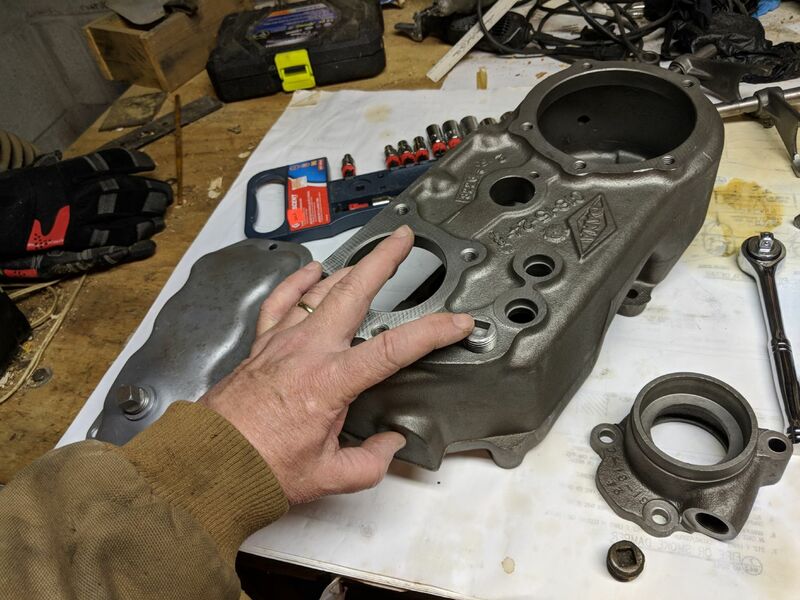 I have a big mouth (4") Dana 18 out of a late 60's CJ5 I will use. I will also replace the 2nd gear and synchro's in my T90 at that time to try to solve the jumping out of 2nd problem I currently have. I hope to have this done before the FCT in September if I'm lucky enough to get drawn to go. The machine shop right next to my office has a "hot tank". The same washing cabinet he uses for engines. 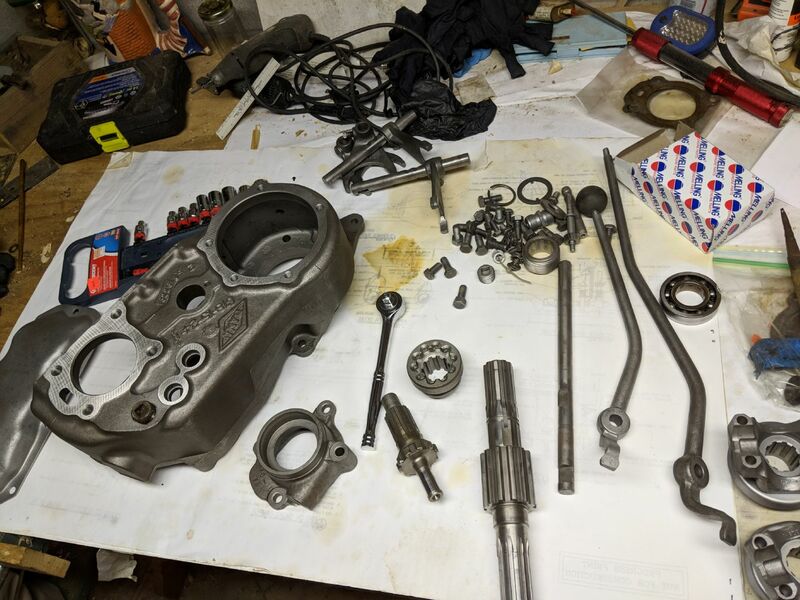 Case, bearing housings, shift rods etc. were $30. I see the nearly-ubiquitous Harbor Freight special 27-LED portable worklight there. Those are the best things HF has ever given away! Looking forward to the "rest of the story"
Bob you and Steve got me all excited on this topic so I decided to put another one of my transfer cases together today. This one is going to be a big hole D18 with a Tera low gear set plus tapered Intermediate shaft bearings. Parts were all setting since last fall and ready to assemble. The TeraFlex instructions say to remove 1/2" of the shorter shift rail to avoid interference with the intermediate gear. I don't have any instructions but found that my large intermediate gear barely clears the short shift rod with the poppet ball engaged into its position. When I get back at it tommorrow I think that I'll cut 1/8" of from the short shift rod. Yes the intermediate gear and the out put shaft must be in their proper positions to determine the working clearance. My big sliding gear just cleared the large shift fork so I left the fork "as is" without additional grinding. By the way Bob, those are great pics that you posted. I can see what it takes to get a camera along with good lighting into that confined space. Wait, did I say hot tanked? I meant to say I scrubbed the case clean with a toothbrush. Yeah. An NOS, natural hog hair bristles toothbrush. And Murphy's Oil Soap. Yeah, that's what I meant to say. [quote] <span style=": rgb248, 248, 252;">The TeraFlex instructions say to remove 1/2" of the shorter shift rail to avoid interference with the intermediate gear. Great! 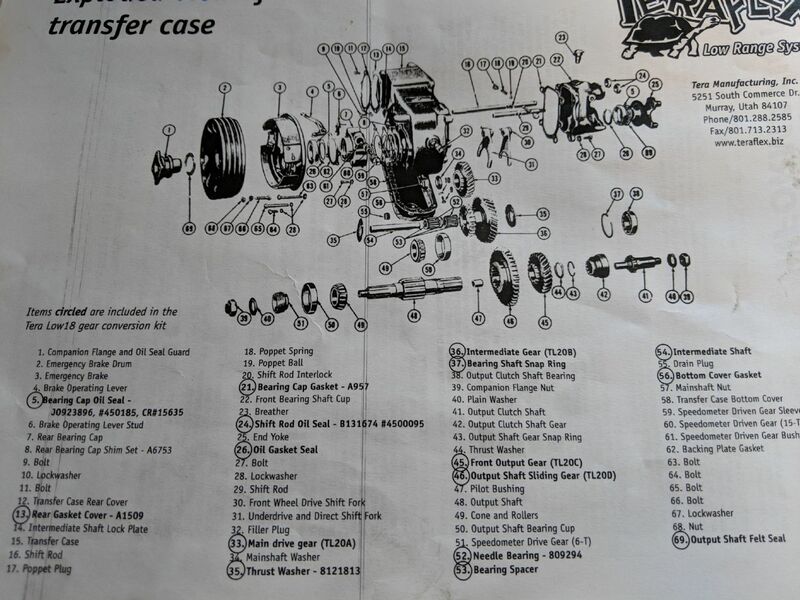 I must have read and re-read your transfer case information about a dozen times so far. Ken, You're not missing much if you don't have the TeraFlex directions. There is this little intro and then the rest of the directions are 2 pages of reprints of a Haynes or Chilton manual.